En revanche, le coup de théâtre final, bien que télégraphié, a le mérite du réalisme. Et les deux vedettes interprètent avec conviction et émotion leurs partitions schématiques. And if you were already scared of the water, this movie will certainly further enhance that fear. 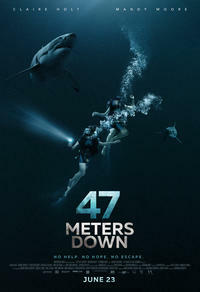 But on its own B-movie terms 47 Meters Down works just fine, not wearing out its welcome thanks to its quick set-up, rapid pacing and brief running time. 47 Meters Down’ Review: Mandy Moore Battles Sharks, Asphyxiation on the Ocean Floor. I am also trying to say that whoever came up with this film's ending should be chopped up into chum themselves.